Clematis vitalba: Old man’s beard, traveller’s joy, virgin’s bower, ladies’ bower, love vine, traveller’s ivy. When the feathery seed heads of Clematis vitalba start to appear in the hedgerows, one knows autumn can’t be far away. Walking along the clifftops yesterday I observed this rampant climber piling over railings and smothering less vigorous neighbours. In folklore, old man’s beard (as I prefer to know it) was associated with the Devil because it did his bidding by trailing into other plants and choking them. In New Zealand, where old man’s beard has made itself a little too much at home, this is a trait that has rendered it ‘clematis non grata’. 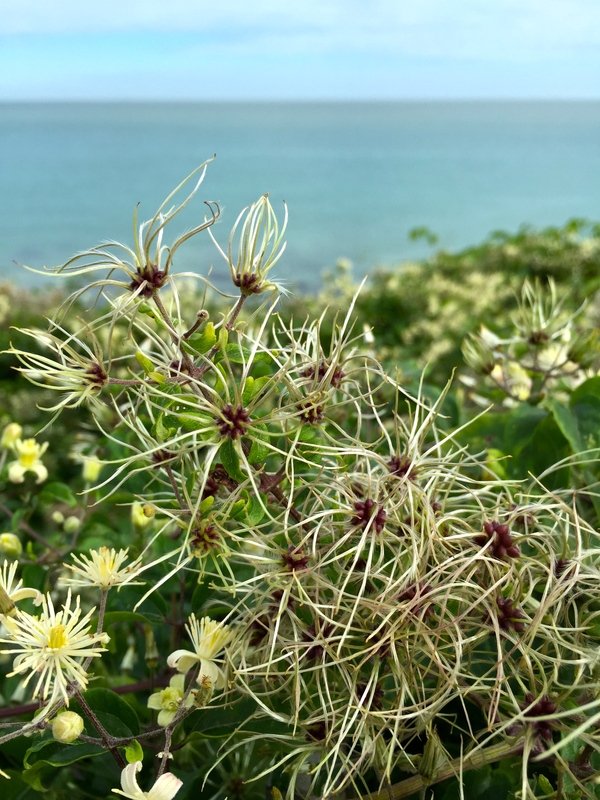 On the other hand Clematis vitalba is also connected with the Virgin Mary and God because of the white, feathery appearance of its seed heads. The relationship with garden clematis is clear to see in the clinging stems, trifoliate leaves and simple flowers. The petals (actually sepals) are shrunken and recurved making the central boss of creamy stamens appear exaggerated. The tiny, almond-scented blooms are the colour of Jersey cream and borne in profusion from July until September. They are followed by unripened seed heads; gently hairy, pods flailing like a demented octopus. 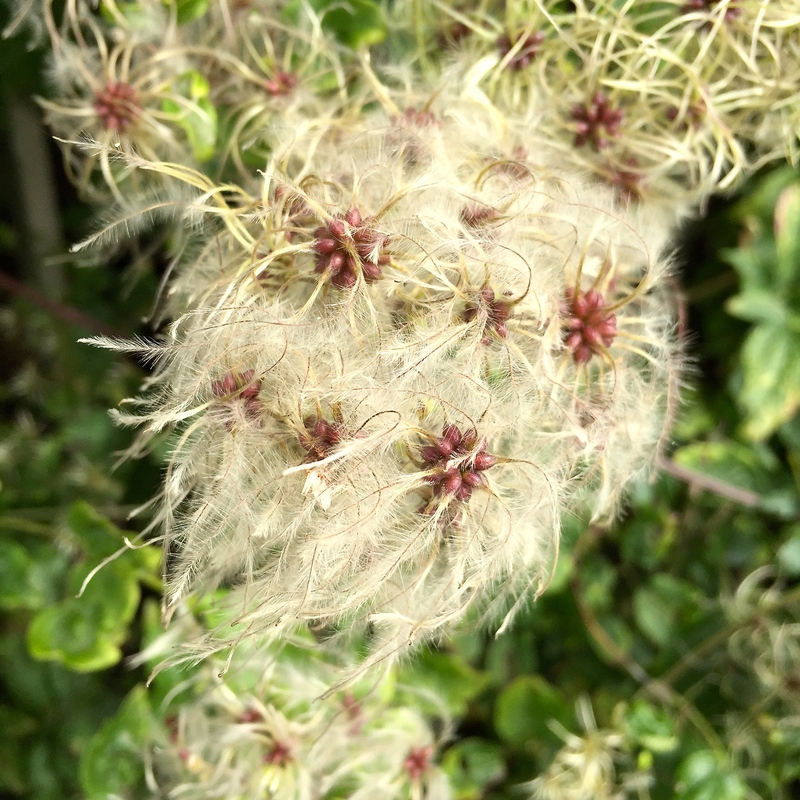 These quickly fluff-up to create the feathery white tangle which accounts for the name old man’s beard. Despite its enormous vigour, Clematis vitalba does have a place in larger, wilder gardens in the UK. The plants prefer an alkaline soil (hence the proliferation along our chalk cliffs and railway embankments) and a moist climate. If you can offer both then be sure you have room for a climber that can extend over 50ft and seed itself with abandon. It can be grown from wild-collected seed and I have never seen a plant carry any kind of disease. Like many wildflowers, Clematis vitalba has had several uses through the ages. The stems were used to make rope during the Stone Age and were valued for weaving baskets and binding sheaves of grain because mice would not gnaw through them. Clematis vitalba is also considered to be an effective cure for stress and nerves. Be warned – it’s not a plant to be consumed unless you know what you’re doing with it and can be poisonous. The French name for old man’s beard is ‘herbe aux gueux’ – the beggar’s or rascal’s herb. Beggars deliberately used the plant’s acrid sap to irritate their skin. The resultant sore and ulcerated look was said to induce sympathy in, and a donation from, passers by. Don’t try this one at home! When I was at horticultural college I once admitted that I was not a great fan of clematis…I don’t like their bare legs and dinner plate sized blooms on the popular varieties. It didn’t go down too well with my peers and lecturer I must say! However I do like this one in the wild though! Great photos and very interesting info…many thanks! I’m with you on the large flowered clematis. I had a friend once with a ‘Daniel Deronda’ that she loved but I secretly hated it. Much too top-heavy. I find species clematis and viticellas much more appealing and am partial to the herbaceous types although they don’t seem to like me much! Yes herbaceous types are good…Clematis recta purpurea I do grow and love but then I do have a penchant for dark leaved plants! They are really pretty, so happy looking with their yellow centres and creamy fuzz 🙂 Do they bear scent? They have a very delicate almond scent, but you have to lean right it to get it! They are pretty in the hedgerows but they are very unwelcome in the garden where you only seem to notice them when they are big and scrambling over everything. They are fiendishly difficult to dig out. 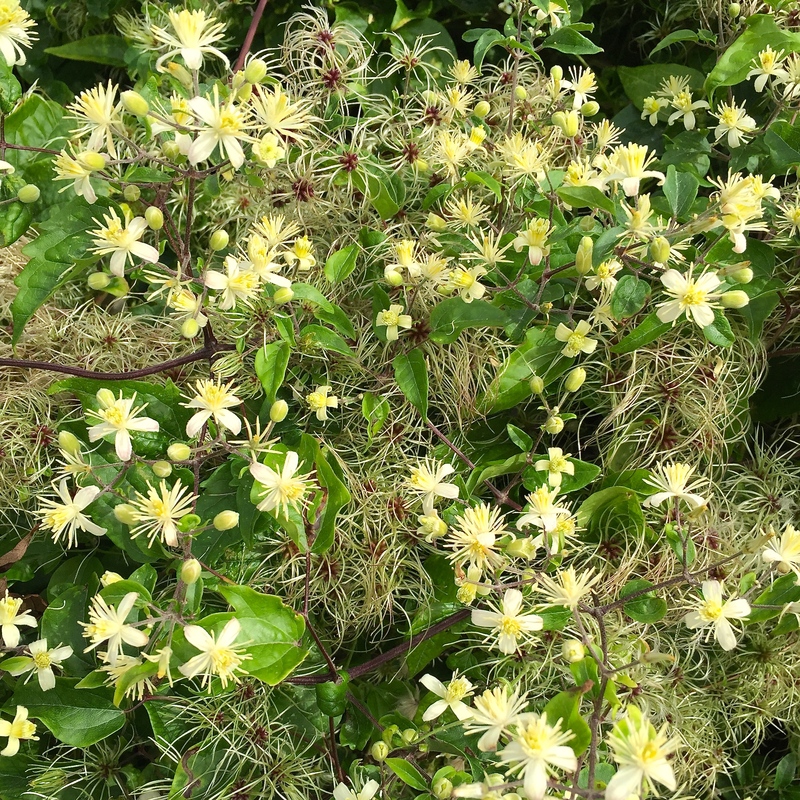 A similar one which is much more elegant and well behaved is the lovely fragrant Clematis flammula. I have rooted an Alcalthaea ‘ Park Rondell’ for you as promised. If you email me your address I will send it to you. Fingers crossed Judy. You’d see a lot of Clematis vitalba if you went walking in England during the autumn. The seed heads are all the more attractive against a backdrop of colourful leaves and interspersed with berries. Our daily flower candy … how we love and need it.